I have been LOVING hearty, comfort food meals lately, as I’m sure most of you have been too. Soups are being made on a regular basis, slow-cooked meats, along with mashed…well, anything. Thing is, coming up with hearty Paleo meals can get a little tricky. Growing up, comfort foods generally meant one thing: carbs. AKA. bread. If you’re like me, the journey away from bread can be a slow (and sometimes torturous) one. So come fall/winter, when your mind might wander to homemade bread smells with melted butter (apple butter! you feel me? ), you’ve gotta work up some strategies to get those thoughts right. Step 1: finding better carb sources. My go-to: squash. I raid the squash section of the grocery (if I haven’t already gotten ten variations in my CSA) in order to keep meals different and creative. Roasted delicata works wonderfully topped on a salad. Acorn is so yummy stuffed with savory or sweet ingredients. And the feature of today: the reliable & versitile butternut. 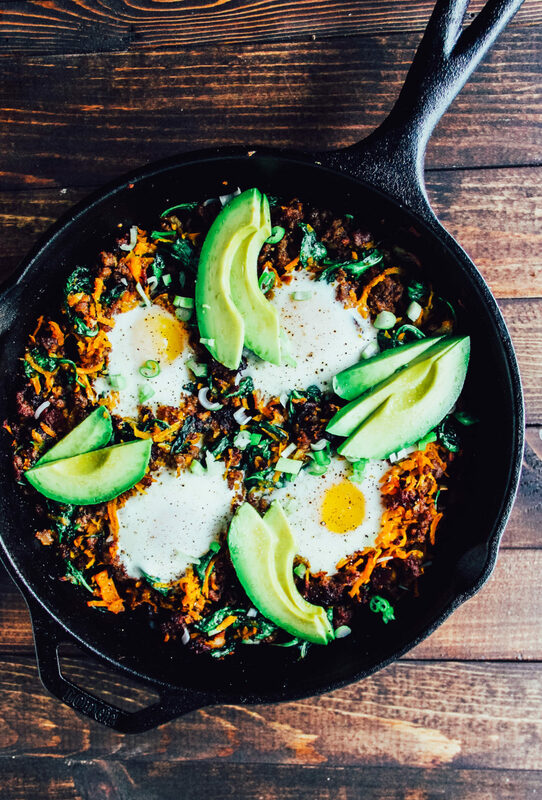 Delicious raw, roasted, or sauteed into this hearty breakfast skillet. Step 2: nourish yourself. If you are craving a comfort meal, there’s no need to rely on overly-filling, dense bread to provide a feeling of satiety. Include healthy fats (like those from the sausage/ground beef and avocado) in your meal to offer a not-overly-filling sensation while still satiating your hunger. Don’t skip the yolks! Depriving your body of needed nourishment (it doesn’t only come from veggies!) will only make sticking to your goals that much more difficult. I call it breakfast but it’s a very flexible dish. The addition of the sausage makes it very breakfast-y but switching it up to ground beef removes that familiar smoky breakfast taste, making it a great lunch or dinner meal. Add different fall veggies, increase or decrease the meat (and eggs) to adjust for serving size. It’ll work out just the same with cook times regardless. Find your comfort this season in truly nourishing meals. Crisp the bacon in a minimum 10″ cast iron skillet. Remove the bacon to a paper towel to cool. Add the onion and sauté until translucent, about 3 minutes. Add the pork sausage and cook until browned, about 10 minutes. Turn your broiler to high. Add shredded squash (recommended: the shredding blade attachment on your food processor) and spinach and cook until soft, about 3-5 more minutes. Crumble the reserved bacon and stir it in. Press small pockets into the mixture, enough to fit the number of eggs you’ll be using. Crack the eggs into each of the pockets being careful not to break the yolks. Broil on high to desired done-ness. 5 minutes yields medium runny yolks. Broil shorter for very runny or longer for a solid yolk.